I found this gem on eBay last week and couldn’t believe my eyes. Yes, this is how it all started way back when. Someone gave me this toy for Christmas when I was 11 or 12. I loved this toy! 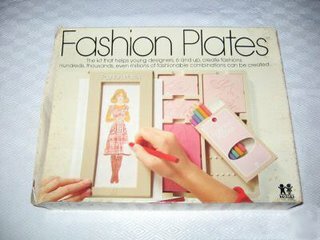 It is the only toy I remember from my childhood (after this came 12 for 1 cent albums by mail LOL) and I remember spending all my time making rubbings and plastering my bedroom wall with my creations. Mixing it up… this top with this skirt, this top with that skirt. You know. I even made rubbings inside my peechee of cute little outfits. I am sure there was only one pair of pants and the rest were skirt plates. Travesty. Anyhow, this set eventually sold for $55 and I wasn’t the high bidder. Who knew a) anyone still remembered this toy enough to bid it that high b) anyone still had intact sets and could get that much for them, or c) no one played with this set enough to lose all the pieces like I did… I mean wear them out like I did. Oh wow! I had one of those when I was a kid too. I haven’t thought about that thing in years. I think I was somewhere between 9 and 11 when I got mine. 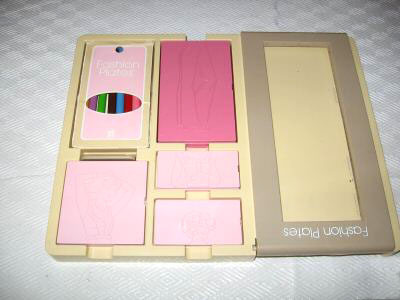 I did play with this toy some, but I was very much a tomboy at that age so it didn’t get worn out. ARGH! Had I KNOWN! I was just telling a co-worker about this toy because her 9 y.o. daughter is obsessed with drawing fashion. We thought she’d love this thing (I know I did when I was 9). Er… although maybe not for $55. Yikes. Did you know that there’s a new version of this out now? It’s similar anyway and comes with a lot more clothing options (and more pants). There's actually extra plates you could buy. Currently on eBay there's one with all the extras for $70. I want it but not that badly! These were my favourite as a kid too. I can't believe they are so collectible now. It's nice to see, but it makes me feel old! Haha.